This photo is going to turn out to good to be true. What it’s about is what was kept secret in Daniel 8:26 to be revealed in these latter days. In Daniel 8:9-14 stars and hosts were dragged out of heaven, by the horn which is today’s establishment, and born as human beings who have been getting trampled ever since birth. The stars and hosts were angels that were born as human beings. And beyond that is the Covenant that set prisoners free from a waterless pit in Zechariah 9:11 by the blood of the Lamb. Revelations 9:1-2 tells you of when a star fallen to earth who was given the key to the bottomless pit, and he opened it up. Those prisoners in hell were born as human beings also. The good news of the Gospel has been preached all to all Nations so we are living near better days to come. The only thing that needs to be preached is the eternal gospel of Revelations 14, which is to fear god and give him glory, which to me, is to do deeds of compassion for those in need, which is true worship. Have as much fun as you can along this road of life while ya at it. Then, “Woe. I’m Michael. I can never tell this to anyone without them thinking I am crazy.” 4 days later, a friend told me of how the dragon dragged a third of the stars out of heaven. Well, I opened up Revelations 12 and saw 12 stars on the woman’s head travailing to give birth, and there are 12 Dewey’s in my family, and mom had told me 2 weeks before I had taken 4 days to be born. The child was caught up to god and his throne. Well, back in 1982 I had 277 volts go in one hand and out the other falling off a 6 foot ladder and landing on my head. For months after there was this white chair, like the Lincoln Memorial, in the back of my mind. I was standing off to the left, with a body laying before the throne, and a voice saying, “That is you.” Since I had just left the born again church stuff, I had thought I had been judged, so I drank for the 80s. It wasn’t until 2 years after that rocking down angels awakening of 1994 that I even remembered that 2 men had told me in 1978 that I was the arch-angel Michael. (That is just what they said and figure now that either Arlo Guthrie, Steve Miller or John Lennon figured out who number 9 was. And Arlo Guthrie for singing of a prophet groaning alone in ”Prologue”, and John Lennon for ”Imagine a Brotherhood of Mankind sharing all the world, & ”Revolution Number 9”- where he says near the end, ”Take this brother may he serve you well. (My paraphrase. lol) Rock and Roll is the Peals (I prefer Pearls.) 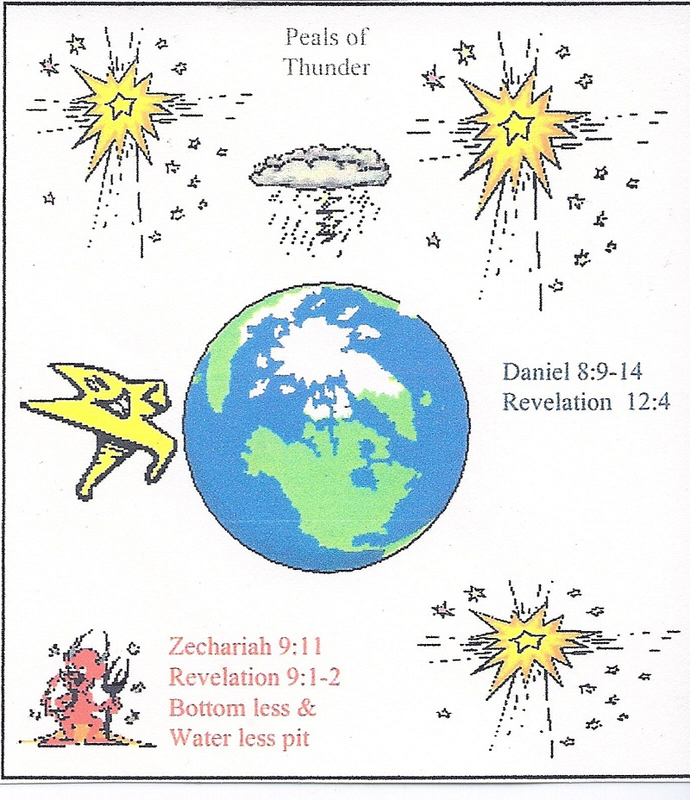 of Thunder’s kept secret in Revelation 10, when the mystery of god will be complete. Lets get down to the Swingtown for we have been over worked and under paid for far too many decades. Let me explain how it came to me that Rock and Roll are the Pearls (As I call the peals) Thunder kept secret in Revelations 10. 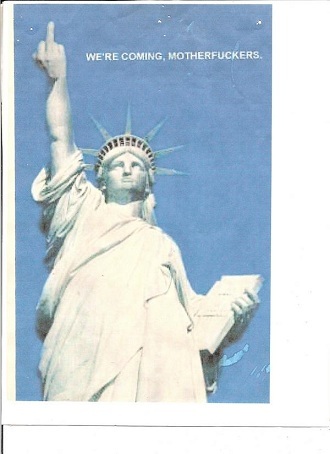 I had been out in California in 96 sending out lots of snail mail all over the country about the good things to happen in these times about Nations beating swords into plowshares and feeding even their enemies, and things like the lion laying down with the lamb. (Sure didn’t see 911 coming.) While writing a brother back home these words came through me, like from the back of my mind which I wrote down as they came: “We may very well have been hearing the peals of thunder for some time now.” Without ever even remembering hearing or reading about them being kept secret in Revelation 10, I knew instantly that they were Rock and Roll. Had figured for those last couple of years that the Rock and Rollers were many of today’s true prophets. Soon after that read Revelation 10 where words kept secret would reveal the mysteries of god, where someone swore by him who lives forever, there would be no more delay. I got to figure today that they are the holy people of Daniel 12:7 where someone else also swore by him who lives forever that when they finish shattering the their power all of the events of Daniel 11-12 would be complete, with somethings being kept secret. Believe it or not, that Covenant of Zechariah 9:11 is about how the days were cut short as the Lamb said they would be in Matthew 24:22. Daniel 12:1 gives you a clue who one of the olive branches are of Revelation 11, of which one is Michael. John Lennon was the other and his death is how the days were shortened. Michael, who is number 9 (Don’t forget The Beatles Revolution #9 song where Lennon says near the end, “Take this brother may it serve you well.”) of 10 kids, and for that matter is the 11th Dewey, must never go to the Big Apple! That is the covenant of the prince who gets shattered in Daniel 11:22, by no other than, the Jewel of The Kingdom an oppressor was sent through in Daniel 11:20. Daniel 11 is about these latter days, for Daniel was told they were in Daniel 10;14. And to add to that, the abomination the Lamb spoke of in Matthew 24 is in Daniel 11:31, the prince shattered in Daniel 11:22 can not be the Lamb. As also in Daniel 9, that Messiah of Daniel 9 who get cut off is not the Lamb either for the abomination is in Daniel 9 That all may seem crazy and complicated. but at the right time many more will understand it. Have lived through the sanctuary being trampled in Daniel 8:9-14. Forty’s Club (How many days did it rain for?) in what I call Lemon-minister, (lLeominster) is that sanctuary that got trampled and has been restored.-though still have not gotten a break from the lady who cut open my social conscience and soul. Maybe the regular sacrifice has been abolished as Daniel 11:31 and 12:11-12 talks of. But the covenant I am speaking of is what they will speak out against in Daniel 11:30. This is out there some, but as Revelations 9:11 calls the angel of the abyss Abaddone or Apollyon, find it funny I had A-bad-done by a lady I called “Sweet-Poly-Purebreed” A-bad-done by A-Poly-on the way through the velvet side of hell. Put the pun aside, for there is no doubt about the destruction Abaddone would like to do to today’s establishment, leaving only the foundation. Abaddone means in Hebrew destruction. Who would want to be the destroyer as Apollyon means in Greek? All of us aware enough to have had enough But remember, those let out of hell have no authority to kill, but only to torment “the powers that be” for 5 months, until they understand their only chance is to pay back to the regular people. What do we do? Not sure if there is much of anything anyone can do. It just ain’t been time. But here are some ideas that have come my way which I think could.turn the tide in favor of the people. How about if we get Churches together in Communities, to hold a year of Jubilee right now? While a few times a week we celebrate Thanks Giving Dinners of being passed over the insanity of our leaders. This Space Cowboy believes it’s time to fulfill Isaiah 23:17-18, 24:21-24 where kings are thrown in jail and profits are used for that huge celebration in Isaiah 25, when the veil will be lifted off of all Nations’ mind’s eyes. That has to be when they will understand what they have never heard before as is written at the end of Isaiah 52. The hope behind this is to get our leaders to focus on things that will work in this 21st Century. 1. Bring all our troops and CIA Agents home. Let’s leave the tanks and other weapons behind, so countries could protect themselves. 2. Find a way out of the Fed’s fiat trash cash. The best way this space cowboy has heard of for that is for Cities, States, Counties and even Towns to have their own Public Banks, funded through debt free US Notes, which would be invested locally in whatever way Communities see fit, so as to allow them to take care of themselves. Investing in Worker owned Cooperatives modeled after Mondragon of the Basque is a better way to work. Mondragon owns its own Bank and Collage. Check it out on google. 3. And we must end the Drug War. For many other reasons than the paper, plastics, cloths and bio-fuel we can produce from hemp. It is just wrong to punish people for the drug of their choice. If the Powers that be listen to enough of us & act on things needed to be turn around, in the peoples’ favor; the iniquity of America will be taken away in one day with us sitting under each other’s vine and fig tree with no one to make us afraid, as is written in Micah 4:4 when we beat our swords into plowshares. As is written a few times in highly esteemed Daniel, many will be purged, purified and refined to be made ready for the beginning of a new way. Bet the powers that be aren’t ready for that. But am sure the people are going to have a blast when they figure out where it’s at. Ever since Egypt and Libya erupted my mind’s eyes have been on Ethiopia for that would be the fulfillment of Daniel 11:40-45. Soon after that 12:1 talks of a great distress-which I believe is to finish the purging and refining. But ever since reading the lost jewel of Daniel 12:3 have had great hopes for those with insight to leading many to righteousness, on the TV, they either give control of to the Rock and Rollers, or we find a way to hack into it. Today following the last advice given to John in Revelations 22:10-11 would go a long ways towards smoothing things out.. It basically says, “Let It Be and Live and Let Die” which you’ll know are 2 song by the Beatles. Right now, nobody mind’s their own business, for we keep hearing dirty laundry slimming out of our TV sets. The only thing that really matters in this day and age is that no one gets that mark put on them to buy or sell. With the word we-con-o-me in the media half a dozen times a minute or more, it sure looks as if someone has plans for one. Whoever would want to do that to people may not be able to escape a 1000 years of a form of hell, where they will be looking down on the damage they have done, and say, “We did that! We better make up to them or we will deserve the punishment we get. But even they, if it comes to that in Revelation 20 get a second chance by being born again around 1000 years from now. Hey to me, the LittleTON VF, where this pissed off Liberty came from: we repaint by saying whoops. That is fine for the over worked people with nothing, but to whom much has been given, very much will be required! And I mean repainting the picture in the peoples’ favor. This entry was posted in We Are The 7th Generation. Tagged Arlo Guthrie, Daniel, end times, John Lennon, justice, lattrer days, Live and Let Die, new age, oppression, OWS, religion, Revelations, rock and roll, Saving Grace, Space Cowboy, The Beatles Revolution, These Troubled Times, We Are The 7th Generation. Well Celina, the first thing I said after rocking down angels from the promised land was, “I can never tell this to anyone or they will think I am crazy.” It was a year latter when I found what was kept secret in Daniel 8:26, about the vision in Daniel 8:9-14 where stars and hosts being dragged out of and trampled as human beings by today’s establishment which is the horn that dragged them down here. Around that I time I also found where an oppressor was sent through the jewel of the kingdom in Daniel 11;20 (The barmaid that cut my soul open as I was coming out of my shell. And that romance (which never got anywhere.) is what SHATTERED the prince of the covenant (who is not the lamb of 2000 8:9-14.) People back home at Club 40’s (The sanctuary that was trampled in Daniel 8:9-14.) know now my story is true, for many saw it happen. But at this point, if it can’t help fix things it means not much to me. Though will keep waiting for the lost jewel of Daniel 12:3 when those with insight shine brightly when given control of the TV.